As one of the most decorated figure designers of the popular Dragon Ball franchise, Hiroyuki Nakazawa has had in his extensive sculpting career over one hundred figures produced for collectors to chase spanning the entire Dragon Ball timeline. The new Son Goku Fes!! 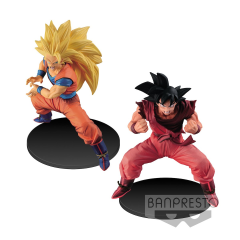 Collection features two of Nakazawa's skillfully designed figures of the mightiest defender of Earth, Super Saiyan 3 Goku preparing for his signature Kamehameha and our hero bringing out the powers of Kaio-ken! These designs show our hero full of action in the heat of battle featuring incredible detail to facial expression and flow of motion. 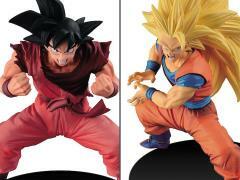 Standing at approximately 5.5 inches tall, each figure comes with its own base and requires minor assembly.